for a family of 4. Average of $300+ Saved Each Year. More Possible for large families! Enjoy Cleaner, healthier Laundry. Promote a Cleaner World. 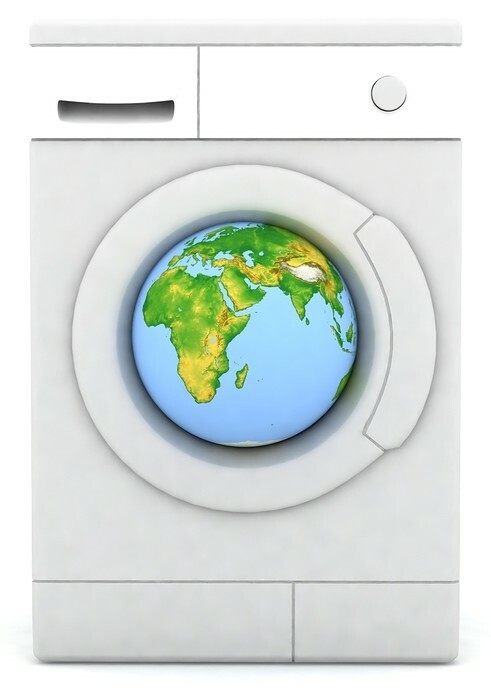 As the world looks for healthier, more energy efficient, and more cost effective ways to do things ... EcoWasher is changing how we'll all do laundry. Ready to start putting cash back in your pocket while getting a better wash? Ready to promote your health ... especially for those with sensitive skin? The EcoWasher ozone laundry system is here to help. Read on! 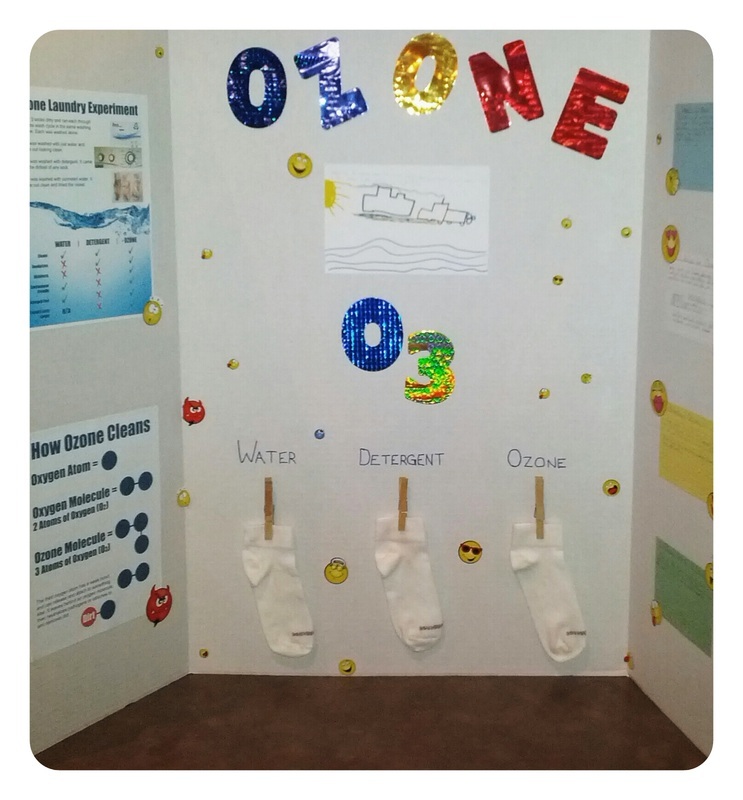 We had been using the EcoWasher ozone laundry system for over a year in our home when my son chose "ozone" as the topic for his science fair. And we loved the system. We got cleaner clothes that smelled fresh, and unlike detergent, we knew that ozone disinfects. 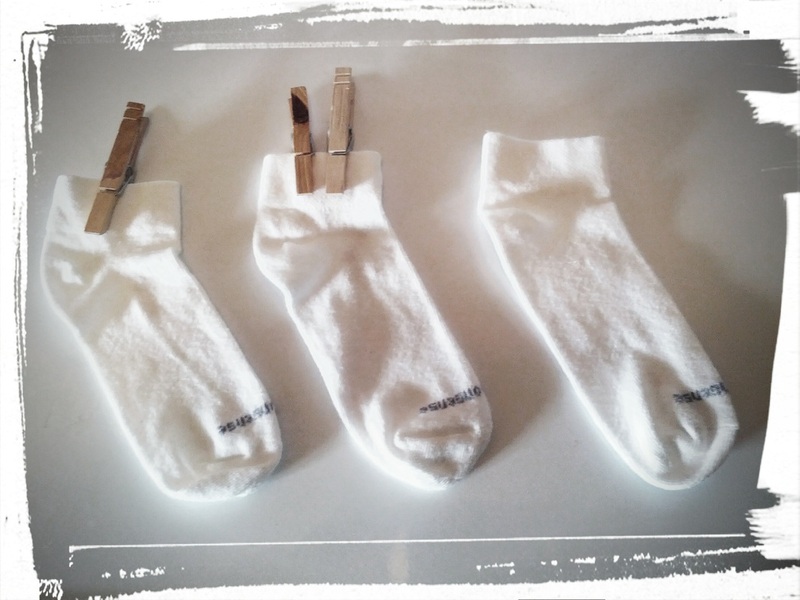 But we decided to put it to the test for the science fair by covering three new socks in soil, then washing them one at a time, all by themselves, all at the same laundry settings. To our surprise, water alone (which started with the dirtiest sock) cleaned better than detergent. You can't see it in the image below, but the sock cleaned with detergent had some subtle brown stains left on it. And unlike detergent, the ozone option put nothing into the environment besides natural dirt and oxygen, and it leaves no soap behind in the laundry. How the socks looked before cleaning. Cleaned using (left to right in both images) water, detergent, ozone. Maybe I should start by mentioning that ozone has been used for YEARS for laundry by hotels and hospitals. The only reason we're not using it yet in our homes is that, until now, residential units haven't been available! A non-toxic cleaning option. The media's raising concerns about the dangers of detergent for children. Children have died or gotten dangerously sick from consuming detergent pods. Why take this kind of risk? Cleaner, fresh smelling laundry that lasts longer because it's not getting broken down by hot water and detergent. Disinfected laundry. * Ozone attacks and disables viruses, bacteria, molds, and mildew. Important for all of us, especially those who work with children and in medical settings. Critical for anyone with immune deficiencies. No more detergent residue, which mats your laundry and can expose your body to its many toxins. Great for people with allergies or skin sensitivities. An Earth-friendly laundry solution -- nothing but water, dirt, and oxygen released into the environment! Cash back in your pocket. Forget about using detergent, hot water, bleach, or fabric softener; reduce your dryer usage and extend the life of your washer, dryer, and laundry. This is an annual savings of $300+ for the average family! Savings of up to $700/year or more for some families of 4, and more for larger families! Choose "EcoWasher Plus" if you have hard water in your home. After a 10-minute installation (so easy even I had no problem with it), your cold water source flows into your EcoWasher ozone laundry unit, where ozone is added to the water. The water then flows directly into your washing machine. Ozone, or "O3" is 3 atoms of oxygen combined into one molecule. One of those atoms has a weak bond, and it easily separates in order to attach to dirt and separate it from your laundry. It also disables viruses, bacteria, molds and mildew. Ozone, for instance, works on bacteria 3000 times faster than bleach ... and more effectively! By releasing that one atom of oxygen, ozone converts back to "O2" ... the oxygen we all love to breathe. Even if it's not entirely used on laundry, ozone will convert back to oxygen within about 30 minutes. You've got questions? Great ... we've included a bunch of answers below. If you need to know something more, please contact us! How much does the EcoWasher Laundry System cost? After a couple of years, the answer is "nothing." Your initial investment starts at $297 (higher for some models). Most American families should expect this to pay for itself in 2 years or less. Meanwhile, you're getting cleaner, better disinfected, and longer lasting laundry and helping both the Earth and your health. Seriously ... I installed it. So yes, it's easy. But here's what that means: you'll place a template against the wall near your washer to mark the spots for two screws. Put the screws into the wall and hang the back of the unit onto them. (I used drywall anchors for the screws -- just pre-drilled a hole, pounded them in, then added the screws.) Put the front of the unit on. Turn off the cold water supply to your washer, then remove the cold water hose from your washer and attach it to the EcoWasher. Run a second hose (included with the unit) from the EcoWasher back to your washer. Turn your water supply back on. Then plug the unit in. Now when you run your wash on COLD ONLY (saves a ton of money over warm or hot laundry loads), the unit automatically turns on and ozonates the water! Can I still use soap and hot water? Yes ... but why? Soap reduces the life of your laundry and tends to leave it matted (less fluffy). It can also irritate sensitive skin, and gets dumped into our environment. Plus, it generally works best in hot water, which costs even more. But if you like the smell of soap or have another reason for using it, it won't hurt the EcoWasher. The laundry unit simply adds cold, ozonated water into your washing machine. The soap will never touch it. If you use hot water (and make sure you are NOT running the hot water supply through the EcoWasher), it will simply cost you a lot more to do your laundry and it will reduce or eliminate the benefits of ozone. (If you've used NO cold water, of course there will be no ozone at all. But if there is ozone, it's most effective with cold temperatures.) So if you use warm or hot water for a reason, or by accident, it won't hurt the EcoWasher laundry system. How did you calculate the average family savings from this product? The numbers can vary WIDELY based on the type of washer used, how much you heat your water, whether you find that ozone laundry reduces your dryer time (it does for many people because there's no detergent left in the fabric), what kind of detergent you use, etc. So we've done our best to come up with some typical examples. According to this popular site, if you heated your water with electricity at 15 cents per kWh and did a mix of hot and warm washes (with cold rinses), you would spend about 30 cents more per load of laundry than if you used cold water only. Using gas, the increase would only be 10-20 cents per load. At 390 loads per year (typical for a family of 4), hot water savings are $40 to $120 per year. The same site tells us that you can save roughly $30 to $60 per year if you're able to reduce a dryer cycle by 10 minutes. Some people get laundry detergent for 5 cents or less per load. Some people pay 50 cents or more. This site's honest assessment suggests the real cost of an average load is around 40 cents, but many sources now recommend using less detergent per load. So we're estimating an annual savings of about $80 in detergent. Annual bleach and fabric softener savings are another $100+ (although you may choose to still use some bleach, depending on your laundry results). In addition to this, using cold water and no detergent means that your laundry, your washing machine, and your dryer should all enjoy longer lives. (You'll see less lint in the lint trap, so you'll know that your laundry isn't falling apart nearly as quickly!) No telling how much this saves you, but we can easily see another $100+ in annual savings here. In total, we think the average family will easily save $300+ per year from these areas, and some families will save quite a lot more. Of course the larger the family, the larger the expected savings. What kind of guarantee & warranty do I get? It typically comes with a 30-day money back guarantee. Depending on the model, it comes with a 2-year or 3-year parts & labor manufacturer's warranty. I've heard that ozone isn't good to breathe. Is this unit safe? Definitely it's safe! We won't get into the entire ozone debate here, but the mainstream concern is that high concentrations of ozone IN THE AIR can cause respiratory tract irritation. Other views suggest that breathing low levels of ozone can help to destroy pathogens in the body (and that this detox causes breathing problems for some people). Regardless, when ozone is used IN WATER, it does an excellent job of cleaning and disinfecting. Still, using this laundry unit will increase ozone concentration in the air in your laundry area during the wash cycle. If you're sensitive to breathing ozone, simply start your laundry, then step away while it's washing. You'll love the results of ozone-cleaned laundry! We Recommend Amazon. Includes Prime Shipping.